Well, I am a huge Damian Marley fan, he certainly drew from his father’s genes no doubt. And of course, I love Nas for being the lyricist and storyteller that he is. We have already seen what can happen when these two forces are combined, it’s musical bliss and sheer madness. 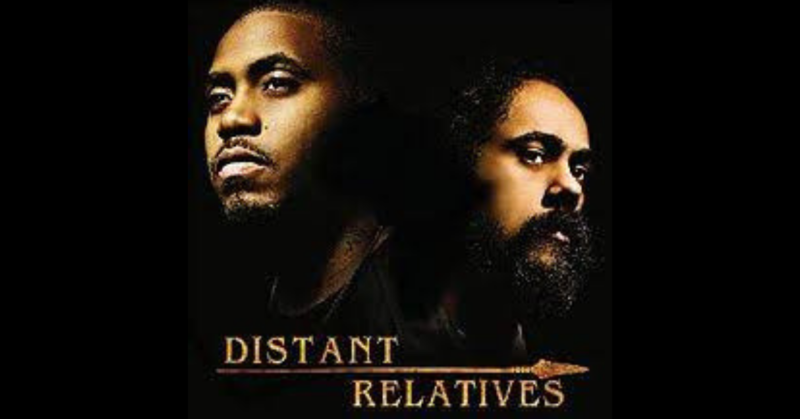 Well, their soon to be released album Distant Relatives is no different than their last collaboration, they just upped the ante a notch. Bliss and madness has now escalated to bliss and mayhem in epic proportions. A few weeks ago, I headed up to Universal Records to hear the soon-to-be-released album Distant Relatives and let me say this: it will not disappoint. I sat on the sofa, truly not expecting what to hear. The chemistry Damian and Nas possess was clearly exhibited on their 2005 duet “Road To Zion” featured on Welcome To Jamrock. And the title of the album is a reflection of their relationship; the foundation shared in their ancestry through Africa. You can hear all the influences: hip hop, reggae, roots/ska – there is a healthy helping of them all throughout the album. Here is my take on their work, from my point of view. 2) Tribal War (feat. K’naan): The powerful drum and percussion, seducing beats and K’naan – you can’t go wrong. 3) Strong Will Continue: Personally, I think the track is alright. However, when Nas spits that last verse? Word is born son! (yes you read right!). His delivery seems venom-filled if you will and that’s what gives the song its heat. He is not playing…when you hear it, you will feel his wrath. 4) Leaders: A slowed down mid-tempo vibe, with a heavy bass line. An ode to the great leaders in our lifetime who have been persecuted. Great track. 6) Count Your Blessings: Every album has that ‘radio-friendly’ track and this would be it for Nas & Damian. Accompanied by a melodious guitar riff, the song is the total opposite of what the album serves up. Instead of driving beats and aggressive rhymes, expect a jazz undertone and plenty of horns. 8 ) The Promised Land (feat. Dennis Brown): Classic track with one of the best in reggae. Period. The old school rockers and ska vibe – again, classic. Yup. And wait until you hear the mad rhythm behind that. Nuff said. 10) Angola (Friends): Okay, this may be the only mediocre track on the album for me. It’s like a terribly watered down and simple version of Jody Watley and Rakim’s “Friends.” I can do without it. 11) My Generation (feat. Joss Stone & Lil Wayne ): Yes, kind of an odd combo, but it surprisingly works. Finally, a female voice…and accompanied by a choir! Different indeed. Shocking to hear Wayne actually be straight forward and stick to the theme of the track. It has been awhile. 12) Africa Must Wake Up (feat. K’naan): K’naan does double time on the album, on two great tracks. The best way I can describe it, is a history lesson set to music. A solid guitar solo at the end, buffing the outro of the album. Thanking everyone, noting we are all family because we all come from Africa. That of course, being one of the main reasons why they came together. Bonus Track: Ancient People (feat. Junior Reid): Total roots vibes. Another radio friendly, inspirational track. Both Nas & Damian walk that fine line of spitting and going for the jugular, yet remaining poetic and spiritual. Nas comes with an intensity and hunger that I haven’t heard in a while (mind you, I don’t have his album Untitled, so…). The majority of the album is reggae influenced no doubt. About two of the tracks can be specifically pegged ‘hip hop’ even though the influence is present in all tracks. It’s a damn shame advances were not given, because God knows I would beat the hell out of this album. Universal is keeping it under lock and key! This album will positively be added to my collection on May 18th, unless the album delivery gods have something to say about it before then. 😀 It may not be for everybody, but I LOVE IT. P.S. – THIS ALBUM IS BEST PLAYED LOUD.